Spring is in the air! This week, I put the summer tires on my vehicle and even had to turn on the air conditioner. It works, thankfully. I bought the car in the late fall and never had a chance to test it out. Our snow is completely gone (yay!) and I also opened a window in my kitchen to let some fresh air blow in. I’m living on the wild side! I love Spring weather. It’s not too hot or humid and going outside feels as good as cool drink of water on my skin. It’s my kinda weather! With Spring’s arrival, it also heralds another exciting time – asparagus is in season (or will be very soon). Asparagus is a spring veggie and will be plentiful at local grocery stores and farmer’s markets. It’s the one vegetable that I never minded eating as a kid. I hated just about every vegetable, but tolerated asparagus. Nowadays, I can eat it by the bushel. The only way I won’t eat asparagus is raw. I’m not even sure if you can (anyone know?). I like it steamed or roasted. Sometimes I’ll drench it in butter and other times, I’ll just squeeze a little fresh lemon top. It’s so versatile! 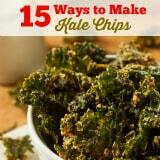 Take a look on Pinterest and you’ll see pinners who have boards dedicated to this nutrient-rich vegetable. Like this one simply called Asparagus! This makes me want to make a new board too…. Ever wonder how to perfectly roast fresh asparagus? If so, you are in luck. 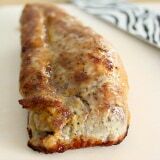 I’ve got a yummy recipe that is so easy to make, you could do it blindfolded. In theory anyways! I told you it was easy! 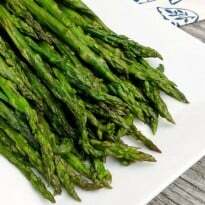 Add a wonderful, healthy side of asparagus to your meal. I often pair asparagus with chicken dishes, but it could really go with anything you make. Roasting veggies really brings out a lovely flavour. It’s one of my favourite ways to cook vegetables. How do you like your asparagus? 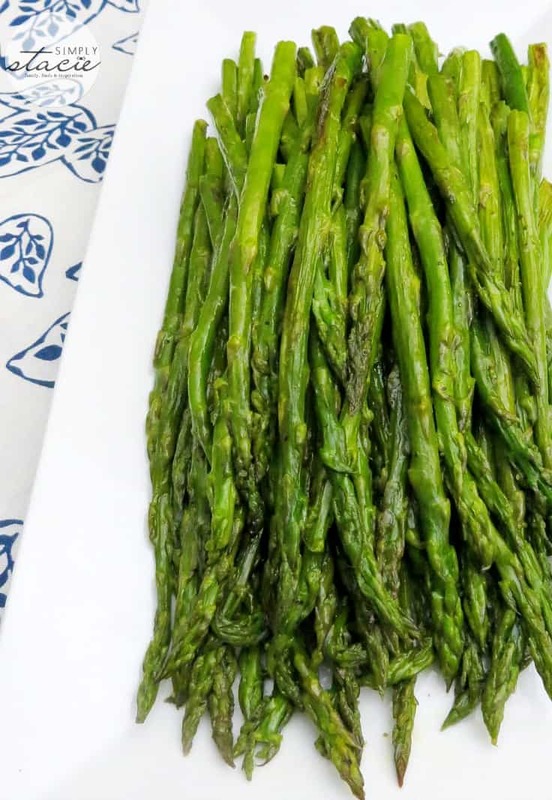 Learn how to perfectly roast fresh asparagus with this simple, delicious recipe! In a small pan, add the olive oil and garlic over medium heat. As soon as you see bubbles forming around the garlic, turn the heat all the way down to low and let it heat through while you prepare the asparagus. Do not let the garlic turn brown or it will be bitter. Trim the tough ends off of the asparagus and place on a large baking sheet. Remove the garlic from the olive oil and drizzle it over the asparagus. Season with the salt and pepper. Toss the asparagus thoroughly, making sure they’re evenly coated with the olive oil and seasoning. Arrange the asparagus in a single layer with most of the ends pointed outwards and the tips towards the inside of the pan. The ends take longer to cook, so this helps ensure even cooking. Bake for 10-15 minutes or until they are tender and start to brown. Toss halfway through cooking. If you want more colour, turn the heat up. This is especially true with smaller, thinner asparagus, which cook very quickly. Asparagus is a vegetable I just started loving. We are not big asparagus fans in this house but have never tried it roasted so might have to give it a go and see what we think. I love asparagus. Sadly, I am the only one in my family that does.. so I don’t make it as often as I would like to. Normally I love it with just some butter. I also add it to some pasta dishes. Thanks for the roasting recipe! I’m going to try it this way next time I make it. 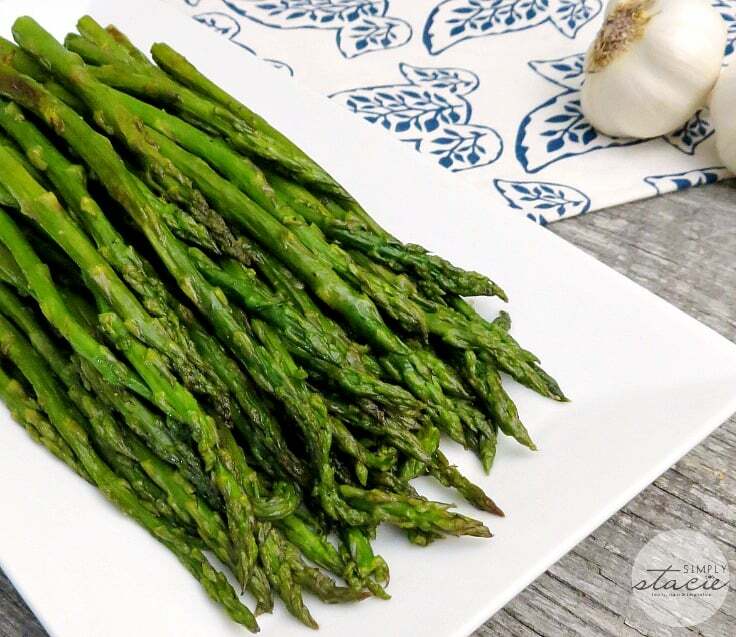 I just love asparagus season–it’s one of my favorite veggies! The whole family loves aspargus! Never tried to roast it, thanks for the recipe! I really enjoy my asparagus lightly stir fried in butter with some seasoning salt. I didn’t try asparagus until I was 16. I have love it ever since. Thanks for the recipe. One of my favourite vegetables. I love it roasted with parmesan cheese and pepper. I like asparagus any which way but my favorite is roasted like this. Thanks for the blog post – a must make soon! 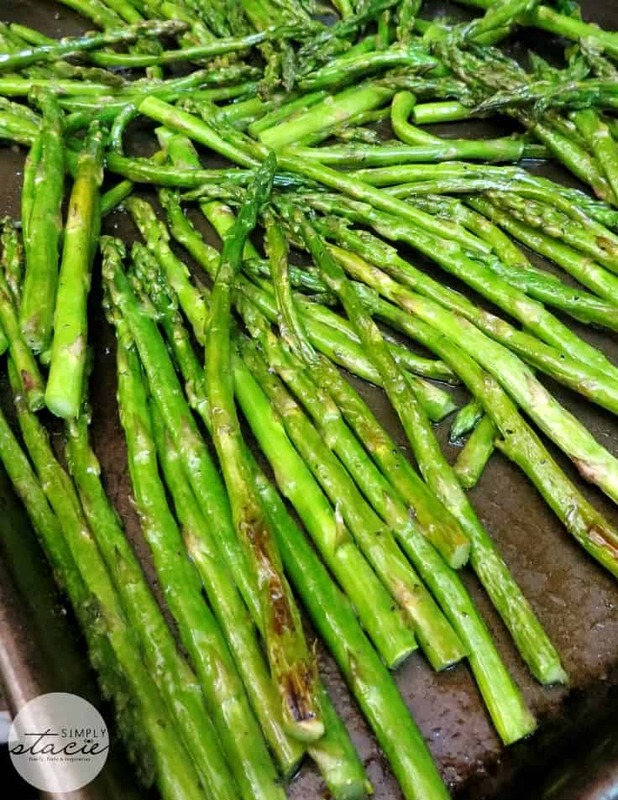 We all love asparagus and I am definitely going to try roasting it.Your pictures look awesome! Yes, you can eat it raw. Also great to serve with other raw vegetables with a pesto dip. asparagus with hollandaise – amazing! 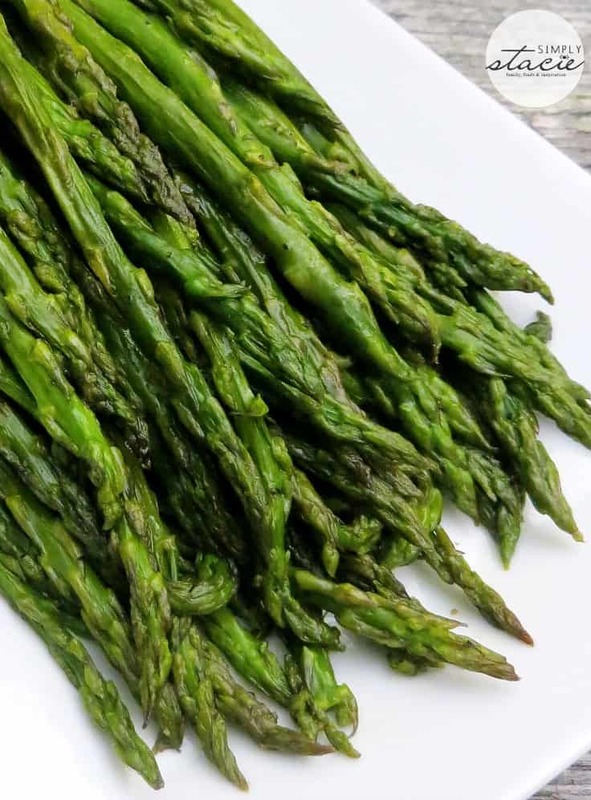 Thanks for posting this easy recipe for cooking asparagus. I use to boil it and this would be so much better! I’m drooling now. I love roasted vegetables of any kind. Looks amazing as always! I love asparagus sauté with minced garlic! Funny, unlike your own experience, asparagus was always my most hated vegetable as a child. I would eat anything else, but asparagus. As an adult, I now enjoy it but do not make it at home very often. I will have to give your recipe and method a try. Thanks. We do asparagus this way, it’s so tasty! I have never had this before I will have to give it a go. short of the added garlic this is the method I have used for some time- will add in the garlic step next time! Thanks! It is so easy and never fails to impress guests! I love this post! 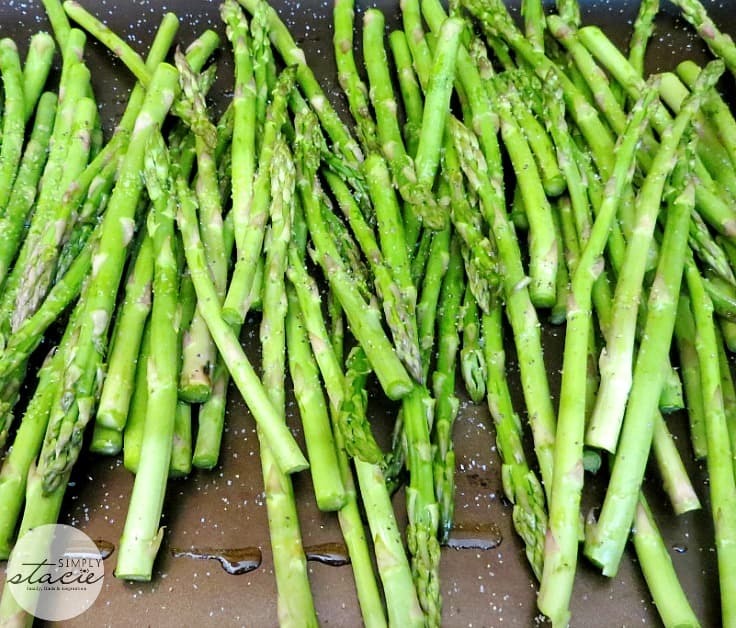 I love asparagus and love roasting veggies, so this is a simple recipe I can prepare! love veggies when they are roasted…and it is that time of year! Raw asparagus is REALLY bitter. It’s safe to eat, but tastes bad. I’ve never roasted asparagus, mostly because I wasn’t sure how. I’ll have to try this next time we have it. I love asparagus as long as it is not overcooked. I usually steam it and serve sprinkled with olive oil, lemon and a bit of salt, maybe Parmesan. I do like it roasted but I find it more work. I had some a few weeks ago, very skinny and the first of the season. I steamed it until about half cooked and used it as 1 layer in a multi-layered lasagna. I had only enough noodles for 2 layers so I used sliced, baked eggplant as a noodle layer and the asparagus and 2 layers of spinach and cottage cheese between. I have never eaten it raw. Any recipes I have seen has the asparagus shaved thinly and with lots of flavourings – probably as Stephanie said because it is bitter. A great healthy recipe for that nutrious veggie! I love asparagus!! Wil have to try this thanks! Hi there! Visiting from the Weekend Re-treat link party. 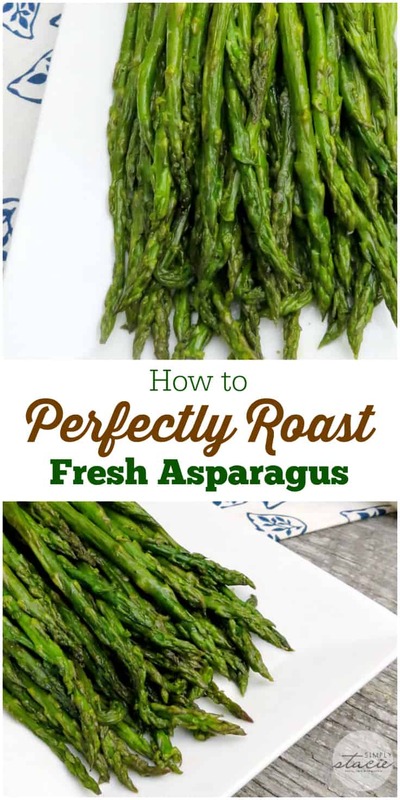 I just finished blanching some veggies including asparagus so finding this post now was perfecting timing! Thanks so much for sharing your method! We haven’t been eating asparagus, not sure why. This sounds tasty and we will have to try it. Thanks! This is my favorite way to have asparagus! 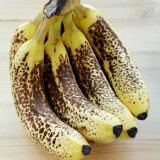 (and pretty much the only way my husband will eat it) Looks like you have a couple of tricks I haven’t seen before that should make it even better. The recipe I usually use calls for the garlic on top of the asparagus and I always worry about burning it, so flavoring the oil with it first is genius. I also hadn’t thought about placing the tips to the inside of the pan but it makes so much sense to do it that way. I’m excited to get to the store and find some asparagus so I can try out this version. Thank you for the tips. I can never cook asparagus properly. Thanks for this. I can never get asparagus quite right so I’ll have to try your method. So simple and delicious! Can’t wait to try this! I need this. Asparagus can be hard to do and taste pretty bad if not done and flavored well. I love asparagus anyway its prepared , its one of my most favorite vegetable . Yes you can eat asparagus raw it actually tastes like raw peas right out of the pod. My favorite way of preparing asparagus is quickly sauteing it in a pan of cooked diced bacon , bacon and asparagus is delicious 🙂 . Thank you so much for sharing. Always looking for a way to add good flavor besides just olive oil, Salt & pepper. However, I do like to use the pepper that has a mixture of red and black, it gives it a little more spice.